With so many types of recreational vehicles in existence, a single policy sometimes can't handle multiple types of recreational vehicles. But at the same time, not many people own multiple campers. If you are able to afford to do so, you probably have bigger worries than being able to properly insure them. Recreational vehicles, also known as RVs, come in all shapes and sizes. Motorhomes, fifth wheels, popup campers, and travel trailers are some RV options. You may or may not require RV insurance depending on the type of RV you own. The main difference in coverage requirements is simple. If you tow it, insurance is probably optional, and if it’s self-contained. You can get it from point A to point B without the help of another vehicle, which means you will probably be required to purchase insurance coverage. Put another way, any vehicle you drive on the road is required to be insured, and that includes motorhomes. You will be required to have minimum liability for your state in order to legally drive on the road. More coverage is available and optional unless required by a lender. Since campers are towed behind a vehicle and not driven by themselves, RV insurance is optional according to most states’ laws. 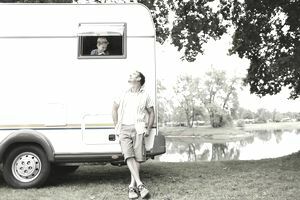 Only a lender can require full coverage to be carried in order to secure its interest, so if you took out a loan to purchase your RV, you can bet that you’ll probably be required to have full coverage. With a newer camper, it is recommended to carry full coverage so you do not lose your investment. However, if you do not have a secured loan, the coverage is optional. Here are the different types of coverages for RVs and campers. Aside from the standard set of coverage on RV policies, companies often offer specialized coverage. Specialized coverage can come in handy at the time of loss. What you may not think of prior to a claim is your custom equipment and personal effects that can be costly if you do not have the coverage included in your RV policy. Total loss replacement is usually only available on previously untitled RVs up to one model year old. Other RVs are insured for agreed value or actual cash value. A claim can be difficult enough, make sure you know how your RV insurance policy reads so you are not surprised at the time of a loss. Custom equipment is important coverage for those RVs with custom parts. If you have upgraded your interior or tricked out the exterior you'll want to increase the automatic limit. A standard policy usually comes with a $1000 limit of coverage. With the high price of custom equipment, it is easy to go over the standard limit. Remember if you are customizing your RV; keep track of how much you invest in custom equipment. Vacation liability is commonly included with a set limit of $10,000 as long as comprehensive and collision coverage is selected. It pays up to specified limits for bodily injury and property damage as a result of an accident that takes place while the RV is used as a temporary vacation residence. Higher limits are available. Vacation liability is usually only available for pleasure users. Personal effects are not usually included in an RV policy. The personal effects coverage will cover your belongings in a covered loss while vacationing in an RV. A homeowner's policy might cover your belongings; however, your deductible would apply. Check your homeowner's policy to verify coverage, especially if you often travel across state lines. Most homeowners and renters insurance policies also don’t cover you while you are in the five boroughs of New York City (Manhattan, Brooklyn, Staten Island, Queens, or the Bronx), so you will need to be careful / consult an insurance expert if you’re driving through the Big Apple in your RV. Specialized coverage is just that, specialized. Nothing is wrong with getting insurance for just the RV and opting out of all the extras. Make what you want clear to your agent when purchasing the policy so you are not paying extra for all the bells and whistles, although as mentioned above several are automatically included at no additional charge. RVs are a popular form of vacation for many Americans. It is a great escape from city and suburban life. Enjoy your vacation time without worrying about a potential loss. Know whether you need RV insurance, and what coverage to purchase if you do.